These two future scenarios are part of a wide spectrum of possible outcomes that are compatible with Plan S. If Plan S is further developed and implemented along the directions illustrated by Scenario B, the scientific ecosystem and knowledge industry will flourish in our opinion. If implemented as described in Scenario A, however, Plan S could lead to what we would consider a scientific dystopia with a strong increase in inequalities and harm to Europe. The scenarios illustrate exciting new opportunities in Open Science, but also our concern that things may take a wrong turn. The success of Plan S and the value of achieving its target critically depend on its implementation and a good implementation would be a bold and crucial step towards truly Open Science. 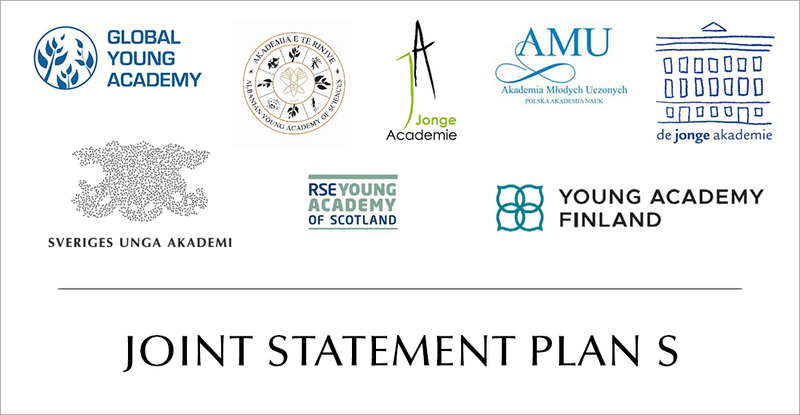 We urge the scientific community and young researchers in particular, who will be most strongly affected by Plan S, to speak up and make their voice heard by policy makers and funding organisations. It is possible to see Plan S as an opportunity and welcome challenge to work together with all stakeholders towards shaping the Open Access system we would consider best for society, keeping in mind that this is an essential part in moving towards Open Science in general. To make our vision a reality we, as young scholars, need and want to engage with the decision processes to make sure that the concrete implementation of Plan S benefits research, creates a future for young scholars, and supports a vision of research that young scholars can aspire to. We are willing to join Coalition S as one of the key stakeholders in the future of scholarly publications and to work with other stakeholders to ensure an implementation of “Plan S” that truly serves society in Europe and beyond. We suggest sustained collaboration between key stakeholders, including researchers at all levels of seniority, to work out further details on how Plan S can best be put into practice, starting with a series of meetings. Subsequently, we will work towards shaping and monitoring how well the implementation of Plan S supports our vision of Open Science, which includes Open Access monographs and other research components such as data. Together we can lead the changes that are necessary to ensure true equitable approaches to disseminating and producing knowledge.